Ruby Jones Thompson, 82, of Roanoke Rapids, NC died November 30, 2018, at Wake Medical Center, Raleigh, NC. Mrs. Thompson was born in Northampton County, NC, the daughter of the late Benjamin Thomas and Pearlie Davis Jones. She was formally employed with Roanoke Rapids Hospital and J. P. Stevens & Co. Her husband Melvin “Buddy” Fitzhugh Thompson, preceded her in death, also a son, Melvin F. Thompson, Jr.; two sisters, Helen DeBerry and Lois Arwood, five brothers, Carl, Shernon, L.C., Curtis, and Billy “Sam”, two half-sisters Irene Hodge and Nita Deans. Surviving are: a son Michael S. Thompson of Roanoke Rapids, NC; a sister, Priscilla J. Downie and her husband Lee of Littleton, NC; a granddaughter, Monica Nicole Thompson, of Roanoke Rapids, NC; a great grandchild, Kenzleigh Thacker, of Roanoke Rapids, NC; and several nieces and nephews. 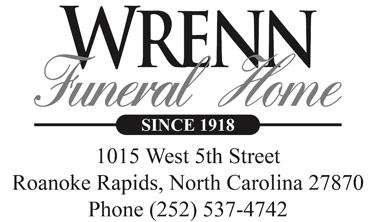 Graveside services will be held at Crestview Memorial Cemetery, Wednesday, November 5, 2018, at 2:00 PM, with Rev. Randy Martin, officiating. The family will receive following the service.